2013 was a special year for West Coast Blues n Roots. The festival celebrated its 10-year anniversary with a magical 2-day event in the glorious sunshine of Fremantle Park. Things have returned to normal for the 2014 event, with the show reverting back to the single day format this coming Sunday 13th April 2014. For WCBnR 11th festival, the good folks at Sunset Events have decided they’d introduce limited early-bird ticket purchases for their subscribers. Simply sign up at Sunset Events to get all the info. John Mayer, Dave Matthews Band, Doobie Brothers, Erykah Badu, Boy & Bear, Steve Earle and The Dukes, Gary Clark Jr., Russell Morris with more good things to come! 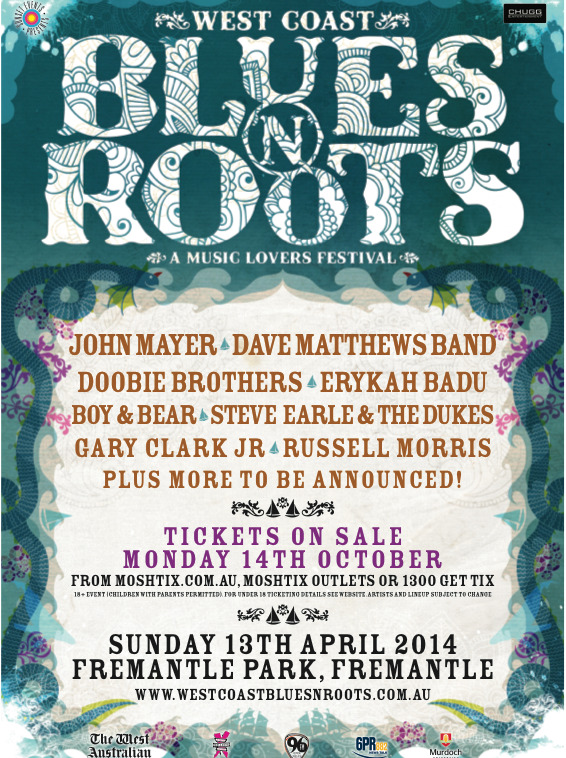 Tickets go on sale to the general public via Moshtix on Monday, 14th October. More ticketing information is available here.